A4228-35A. 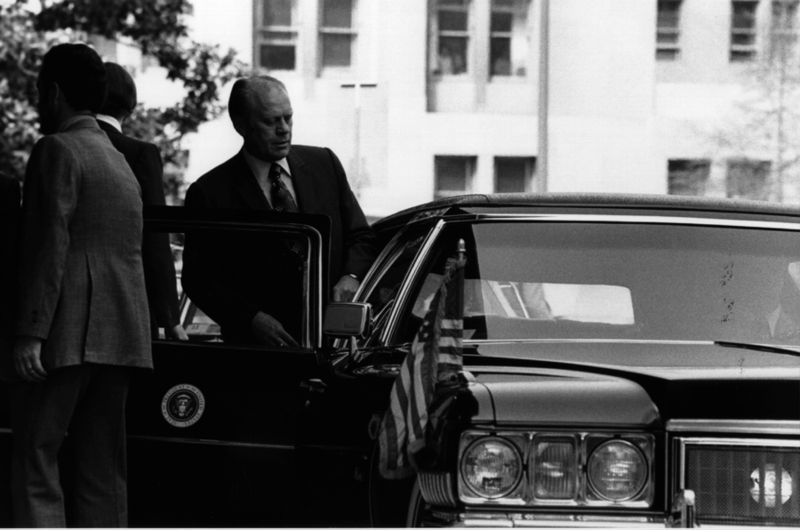 President Ford enters the limousine upon on his departure from Constitution Hall after he addressed the 63rd Annual Meeting of the U.S. Chamber of Commerce. 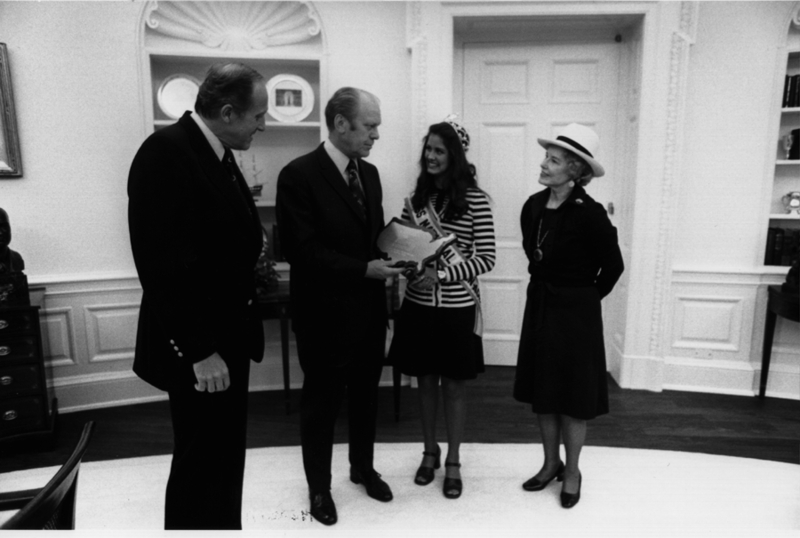 This exhibit allows the viewer to examine the daily diary (a log of the President Gerald R. Ford's meetings and activities) for April 28, 1975. By selecting links from certain activities, you can view documentation (documents, photographs, and even a short video clip) on them. Among other events on that day, the President spoke to the U.S. Chamber of Commerce on regulatory reform, ordered the evacuation of the last Americans from South Vietnam, and posed for photographs with the 1974-75 Miss National Teenager. The President went to the Oval Office. The President met with his Counsellor, Robert T. Hartmann. 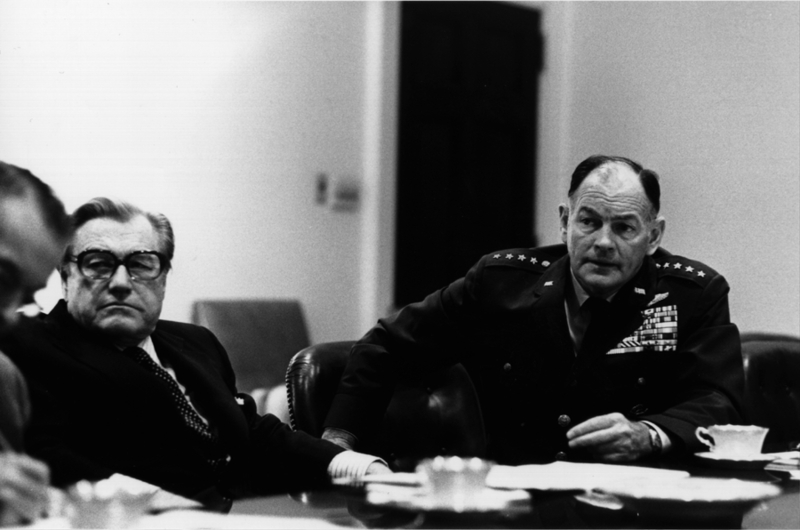 The President met with his Assistant, Donald H. Rumsfeld. The President met with Mr. Hartmann. The President went to the South Grounds of the White House. The President motored from the South Grounds to the Daughter's of the American Revolution (DAR) Constitution Hall, 18th and D Streets. The President attended the 63rd Annual meeting of the U.S. Chamber of Commerce. Charles Smith, Jr., Chairman of the Board of the U.S.
Clinton Morrison, Vice Chairman of the Board of the U.S.
the platform. The President was introduced by Mr. Smith. The President addressed approximately 3,000 members of affiliated Chambers of Commerce attending the meeting. The President, escorted by Mr. Smith, returned to his motorcade. Grounds of the White House. The President returned to the Oval Office. The President met with Mr. Marsh. The President met with Secretary of Health, Education, and Welfare (HEW) Caspar W. Weinberger. ceremony of John Dellenback as Associate Director of International Operations, ACTION. For a list of attendees, see APPENDIX B. The President talked with Secretary Kissinger. The President went to the Cabinet Room. The President attended a meeting to discuss the economy and energy. 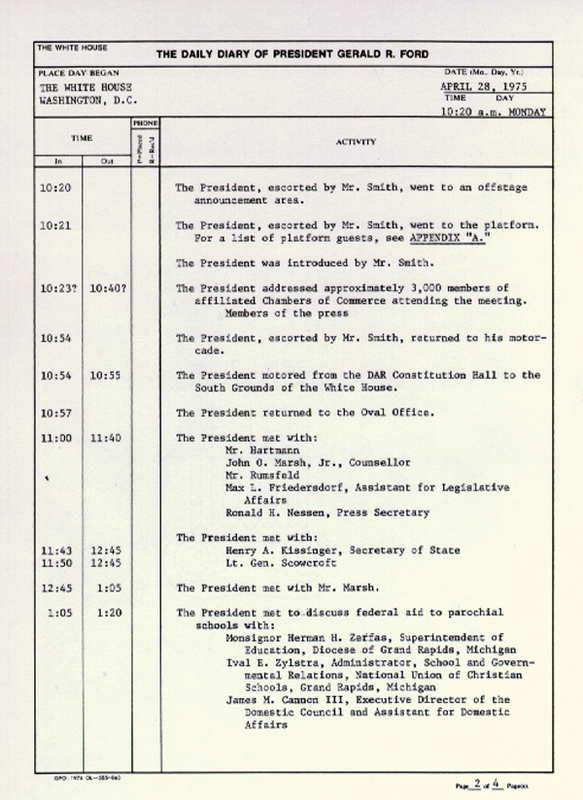 For a list of attendees, see APPENDIX C.
The President, accompanied by Vice President Nelson A. Rockefeller, returned to the Oval Office. The President participated in a National Security Council (NSC) meeting. 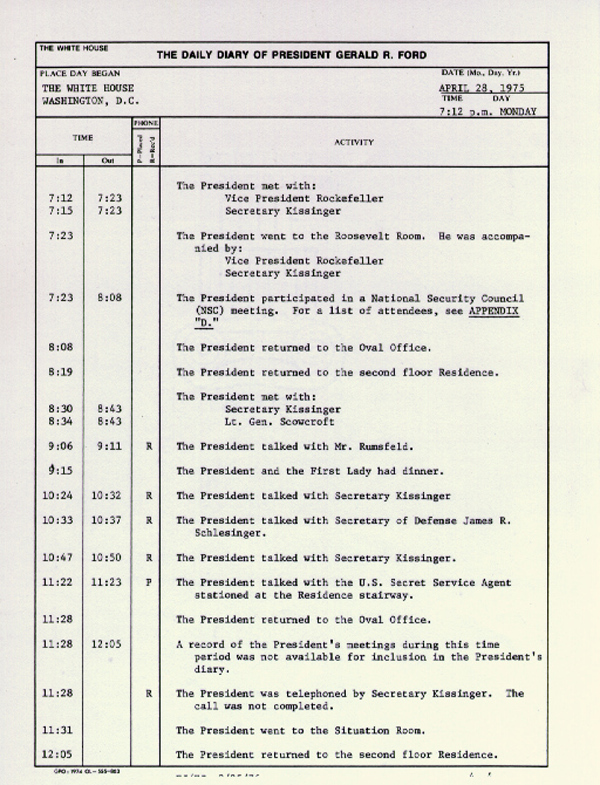 For a list of attendees, see APPENDIX D.
The President returned to the second floor Residence. The President talked with Mr. Rumsfeld. The President and the First Lady had dinner. The President talked with Secretary of Defense James R.
stationed at the Residence stairway. 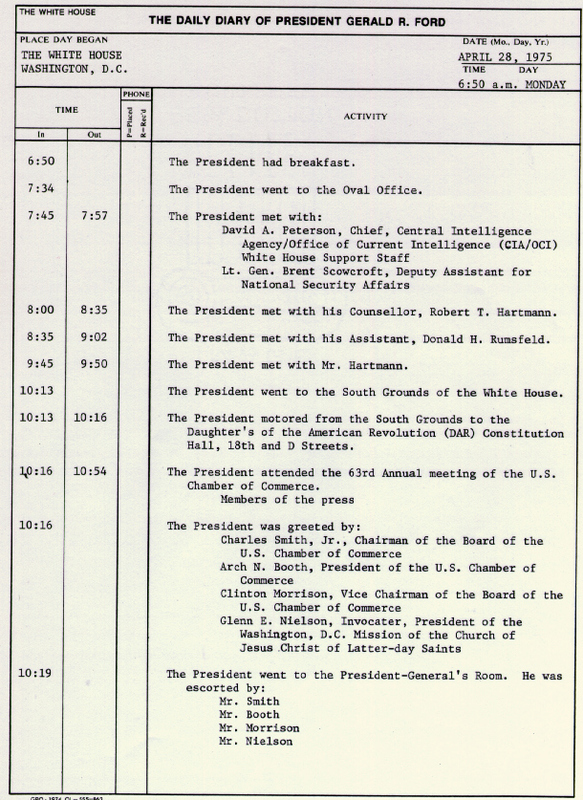 A record of the President's meetings during this time period was not available for inclusion in the President's diary. 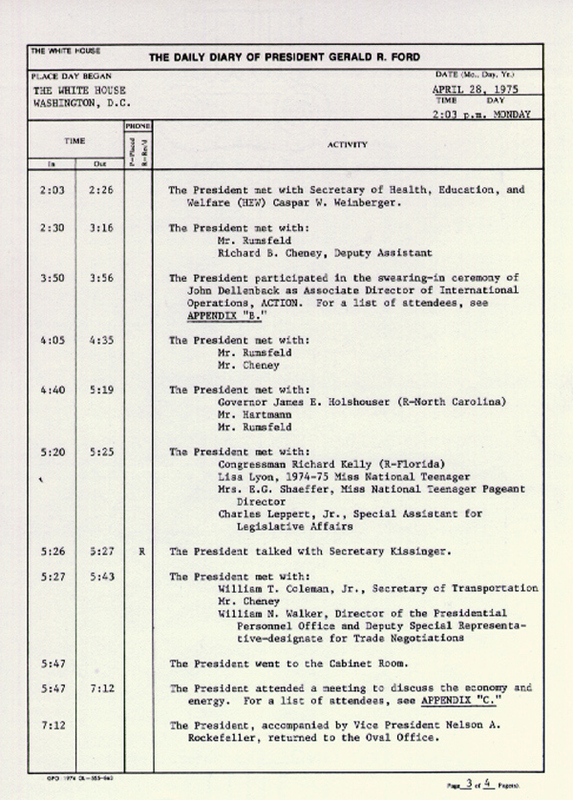 The President was telephoned by Secretary Kissinger. The call was not completed. The President went to the Situation Room. A4228-6A. 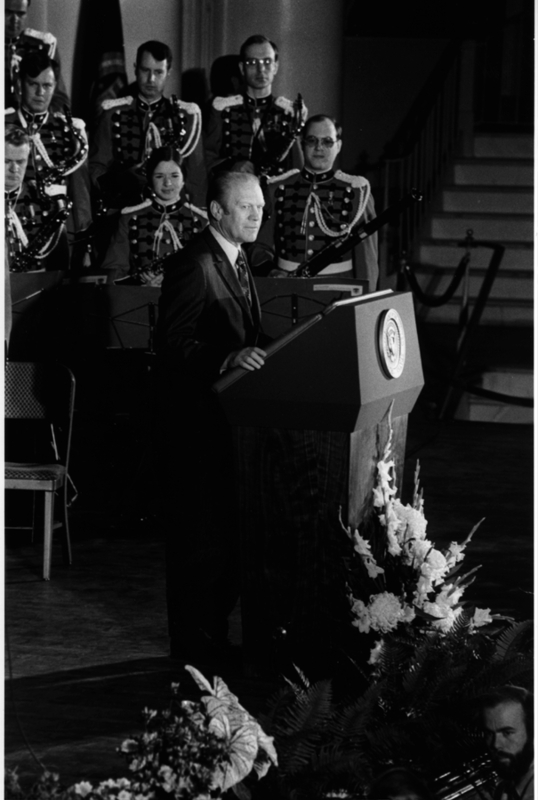 President Ford addresses the 63rd Annual Meeting of the U.S. Chamber of Commerce at Constitution Hall. April 28, 1975. A4253-11. 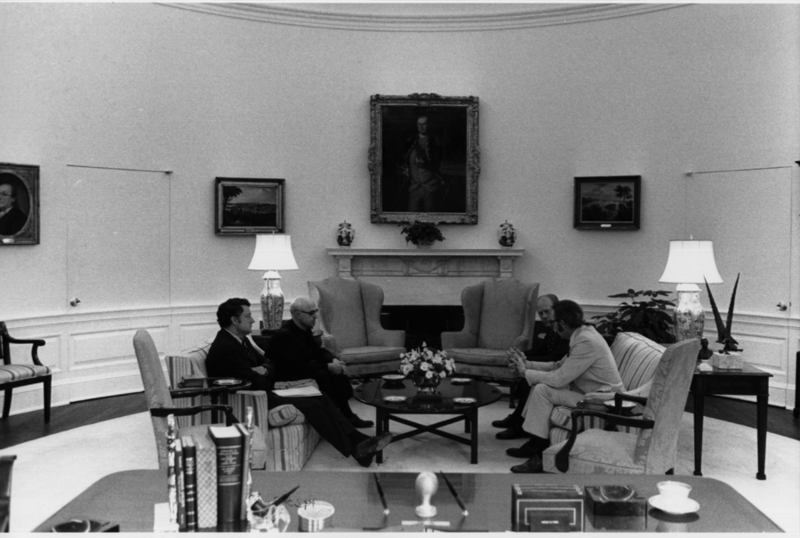 President Ford meets in the Oval Office with Msgr. Herman H. Zerfas, Superintendent of Education, Diocese of Grand Rapids, and Administrator Ivan E. Zylstra. James M. Cannon, Assistant to the President for Domestic Affairs, is also present. April 28, 1975.